Home » Media Room » Events » Did The Manganiyar Classroom teach us all something? This classroom is not a regular classroom where one would open a text book, flip to chapter no. 7 / pg. 36, and train the mind to think like the book. This classroom belongs to The Manganiyars from Rajasthan, where music is in their mind and definitely doing the rounds in the atmosphere. 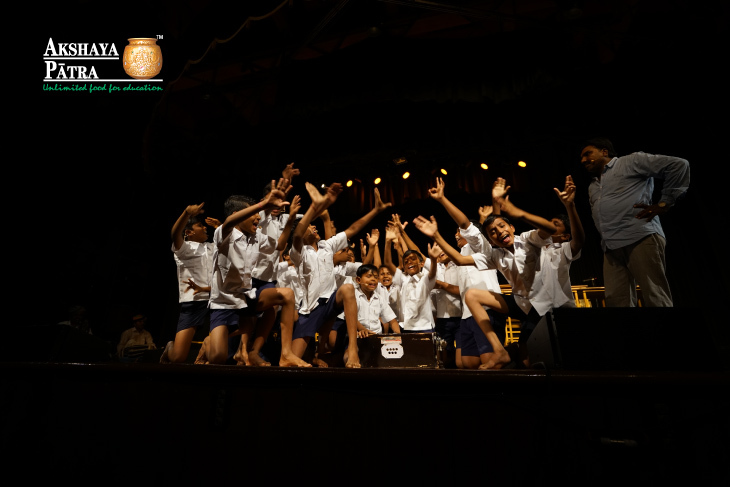 Directed by Roysten Abel, a renowned theatre artist of our times, The Manganiyar Classroom showcased their talent through music which runs in their community and most importantly, they shared a strong message on modern education. With just vocals, drums and other folk instruments, these young boys who are between 8 to 14 years of age took the audience on an awe-inspiring musical journey. The Manganiyar Classroom is definitely worth a watch and we from Akshaya Patra would like to thank each and every person in the audience who made it to the event. In other news, Chords of Giving 3.0 by Akshaya Patra will be back soon!